Irish Construction, formerly known as E.A. 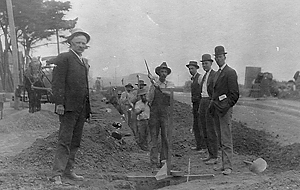 Irish Contractors, was founded in 1919 by Edwin A. Irish who had left his position as Chief of Construction for the Southern California Telephone Company. 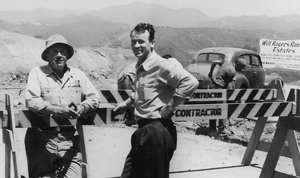 His goal was to pioneer in the installation of underground conduit systems for communication and power facilities throughout Southern California. This was the period following the First World War, an era of tremendous growth and expansion. It became obvious to Mr. Irish that many future power and communication installations would have to go underground as poles were becoming overburdened with overhead lines necessary to keep up with the burgeoning growth. In addition, newer areas demanded the clean, uncluttered look that underground services offered for telephone and power. The yellow and black "Irish" barricade was seen everywhere as an integral part of the growing communities; along railroad embankments where signal lines were installed, on downtown streets where deep concrete vaults and multi-tiered conduit systems replaced the overlade poles and in new subdivisions where residents would be guaranteed a view unobstructed by overhead lines. At the outset of World War II, the Company played an active part in the war effort by installing many miles of conduit and direct-buried cable under the direction of the Signal Corps to serve our coastal defense systems. Following the conclusion of World War II, and the death of Edwin Irish in 1946, the Company was inherited by Mr. Irish's children, Ethel and Bill. Shortly thereafter, Bill's good friend, Jack Warde, acquired Ethel's interest in the company and became Bill's "silent" partner. Under the leadership of Bill Irish, the Company played a role in meeting the challenges of a new post-war era of expansion. 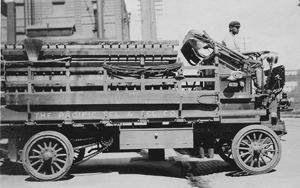 While the need for utility services increased and the Company continued to be active in this field, a heavy division was also created to assist in the installation of flood control and major water transmission pipeline projects which made possible the growth and development of areas outside the Los Angeles basin. Throughout the 1950's a great number of significant projects were successfully completed for the Corps of Engineers, the Los Angeles County Flood Control District, U.S. Bureau of Reclamation, Santiago Aqueduct Commission, San Diego Water Authority and such local districts as Las Virquenes and Callequas. In 1981, Bill Irish retired and sold his interest in the Company to Jack Warde and his sons. A few years later, Jack's son, Greg Warde, joined the Company as its Chairman. With the guidance of Pat Furnare (the Company's capable C.E.O. and mentor to many key employees), Greg assumed day-to-day leadership of the Company in 1988. 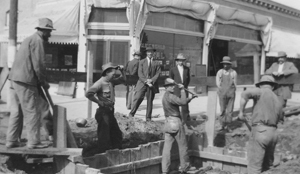 With the explosive population growth in Los Angeles, Orange, Ventura, Riverside and San Diego Counties, and the proliferation of subdivisions and shopping centers, the Company found it advantageous to specialize in the installation of underground systems for power and communication facilities. The advent of Cable TV has been a perfect fit into the Company's construction activities in the communications field. In 1985 the Company diversified and formed Irish Communication Company to enhance their capabilities in the area of communication systems construction. Pat Furnare, whose wisdom and vision led to the formation of ICC, left Irish Construction to become ICC's leader. ICC added the capabilities of communication systems planning, design, engineering, cable placing, splicing, wrecking, high-speed data cabling systems and integrated voice and data systems. Under Pat's leadership, ICC became a leading communication company in Southern California. Throughout the 1990's and the early 2000's, Irish Construction and Irish Communication Company expanded into Northern California and became leading underground and communication contractors in that area. With Irish Construction able to perform all construction requirements, and Irish Communication Company able to perform all engineering and cabling requirements, The Irish Team today is capable of constructing complete turn-key voice and data communication systems. With full-service facilities in San Marcos, Rosemead, Bakersfield, Fresno, Ceres, Sacramento, Bay Point and Morgan Hill, the Irish Team is well positioned to serve its customers throughout California.